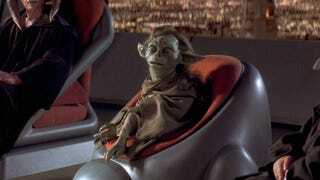 Yaddle chilling after killing a big alien monster. EA keeps canceling Star Wars games, so they might need a pitch for a new one. Here’s my pitch: Yaddle: A Star Wars Adventure. You play as Yaddle and fight things and other stuff happens. Look I’m not a game designer, but I think it could work.